How to Cut Your Tax Bill in 2018 and Beyond - Wealth Legacy Group®, Inc.
A co-owner of a beverage company, “Olivia,” recently sought my help in finding a way to reduce her taxes. In the past two years, her company had become very profitable and she wanted to make sure she would be able to live a very comfortable retirement … very soon! After we explored the benefits of an assortment of tools and techniques to defer or even eliminate taxes, Olivia decided to set up a “Private Placement Variable Life Insurance” contract to reduce her taxes. Using a life insurance contract – to reduce your taxes? 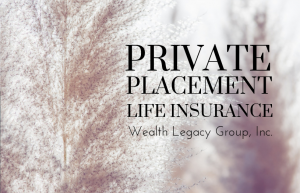 What the heck is a “Private Placement Variable Life Insurance Contract … and why should I care”? A Private Placement Variable Life Insurance (PPVLI) contract sure is a mouthful. “What is it?” you ask. It is a strategy often used by high income/high net worth individuals for years … but more often on the East Coast of the U.S. than us here on the “Left Coast.” Like any life insurance contract, it is made up of two components: a survivor benefit and accumulation value. Normally, life insurance is purchased to provide a survivor benefit, but not a PPVLI. It is primarily utilized as a tax-exempt “wrapper” to hold individual stocks, bonds, mutual funds, and even real estate! (No, this is not your grand-parents’ or parents’ life insurance contract for sure.) It is typically structured to provide the least amount of survivor benefit required by the IRS to just barely qualify as a life insurance contract. By doing this, it reduces the “friction” of mortality charges and thus allows the bulk of the investment account to grow without tax. What are the Advantages of a Private Placement Variable Insurance Contract? Asset protection—assets inside the contract are beyond the reach of creditors (including the IRS) after 2 years + 1 day have passed. As important, the assets are not subject to the 10-year Federal bankruptcy “look-back” rule. If you choose an international situs, a U.S. court cannot force a PPVLI contract to release funds to a creditor. And, while the “wrapper” is domiciled outside the U.S., the assets remain in the U.S. Contact us to learn more about the benefits of a PPVLI and whether it is something you should consider as a tax-efficient investment solution, or if a different solution might make more sense. Let’s brainstorm the unique circumstances of your situation and see what concepts might be most applicable to you. Setting up a PPVLI is clearly not something to “try at home.” The documents themselves are often not “traditional” and need to be properly customized, especially if you are interested in obtaining a PPVLI in another country.